Released in June 2017, the Bike Sticker Multipack is a set of 8 bike-sized stickers, costing just $10 and designed to hang on a retailer’s wall. Sticker multipack, front & back. (2nd ed. Front is same on both.) Scroll down for detailed view. These provocative little conversation-starters are printed on weatherproof vinyl. Ideally scaled for bike frames, they would also look good on helmets, carrying racks, water bottles, laptops, tablets, skateboards, wheelchairs, strollers … you name it. Check the list at the bottom of this page for a retailer near you. If you don’t see one in your area, PLEASE consider buying some multipacks and distributing them to bike stores, coffee shops, schools, or other community-minded venues near you. Each multipack will arrive with a cover letter to potential retailers which you can view in PDF form here. You can also sell multipacks, or give away stickers, at safe streets events, and you can keep a pack for yourself, your friends, your family. By helping to get these stickers into your community you’ll be thanked on social media as a Vision Zero Hero, and you’ll probably make some friends along the way. Thank you for your help in building stronger, safer communities. support safer, stronger communities—which are good for business! Here, in more details, is the front of the multipack, laser-printed on weatherproof vinyl. And here’s the text on the flip side, which may vary depending on the printing. Vision Zero Canada is a registered no-profit advocating to make our street safer for all people, including vulnerable cyclists and pedestrians. The term Vision Zero originated in Sweden, where the federal government committed in 1997 to a target of zero annual traffic deaths. In the ensuing two decades that country has seen the rate of traffic violence plummet by more than half, making Sweden into a world leader in traffic safety. Canada has no such official plan, and we’re in 28th place in the global standings for road safety. We’re stuck in a mentality where the onus is on individual road users to keep themselves safe, and sadly we have the data to prove it. The latest statistics show over 1,800 fatalities and 160,000 injuries on our roads every year. That’s 6.0 annual deaths per 100,000 people, as compared to Sweden’s 2.8 deaths. It’s Sweden’s Vision Zero approach that is making the difference, especially for people on the outside of motor vehicles. The endless ‘wear a helmet’ ‘be seen’ and ‘look both ways’ directives—the mainstays of traditional safety advocacy—do not make our streets safer for vulnerable users. By contrast, true ‘Vision Zero’ addresses the poor design standards, unsafe speeds and driver negligence that are the actual causes of traffic violence. Vision Zero Canada promotes a ‘safe systems’ approach, prioritizing safe passage for vulnerable road users as one now finds throughout much of Europe. For cyclists, these measures include modal segregation (e.g. protected bike lanes, advance green lights) and vehicle regulation such as mandatory sideguards for trucks. We also campaign to calm the speed of motor vehicles via safe speed limits, and with cameras for speeding and red light running. 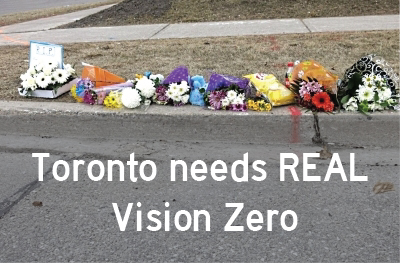 If you’d like to support the campaign for road safety solutions that actually work, visit the website (visionzero.ca) or follow us on Twitter (@visionzeroca). And show the world your stickers to get your community on track. Thank you for helping us build smarter, safer communities ! Participating retailers (e.g. bike stores, coffee shops, advocacy groups) will be listed here, by city. This is a brand new initiative, so please help make this happen in your community! Edmonton, AB : BikeWorks South, 8001 102nd St. and BikeWorks North, 9305 111th Ave (entrance through parking lot on west side of building). 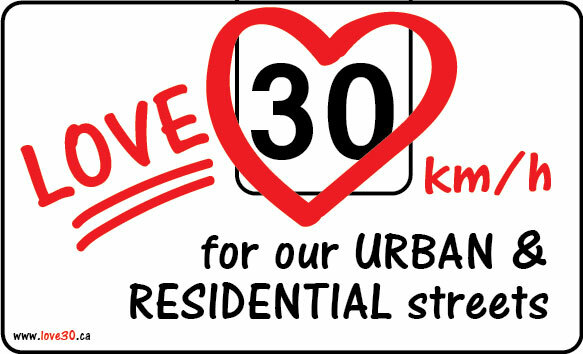 London, ON : London Bicycle Café, 355 Clarence St.
Toronto, ON : Bateman’s Bicycle Co., 913 Bathurst St.
Supplies are limited, so please call ahead to ensure that stickers are in stock. Pour les autocollants en français, cliquez ici. A great way to spread the #VisionZero message: Help get a bike sticker multipack into a retailer near you! Multipack for sale at the London Bike Café in London, ON. Multipacks and free stickers at the Berlin Bike Café, Kitchener, ON.